Hey there, you have know idea who i am but i just wanted to say that i am a huge fan of yours, and i love watching your reviews. 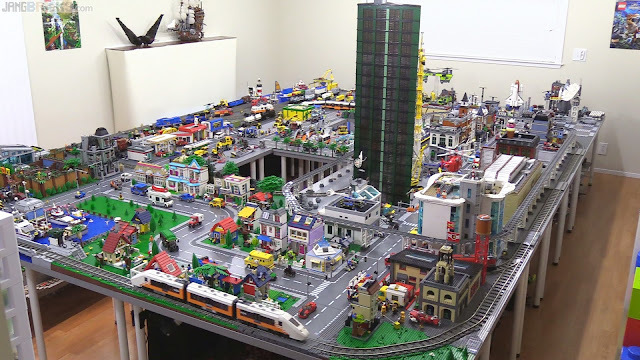 Now i really have been getting into the lego modular buildings recently and it has inspired me to start following your progress on your city. Now i am just a kid and some may think that i have a ridiculous amount of legos but it's nothing compared to what you have. I just have been imagining what i would want in my city and though this might not be relevant to you because this is all happening in my head and not yours but just please give it a thought, mention it in your next progress video. Anyway here it is, I just thought that over where your official Lego space stuff is that you said your getting rid of, you should create some sort of sports stadium, kinda like with power function lights and everything, my other thought was you should make some sort of custom mark on your city or like one recurring pattern of different colored studs that you could just kind use to unite your whole city. You could also hook up the whole entire city with power function lights for cool night setups. Anyway thx for tacking your time to read this.